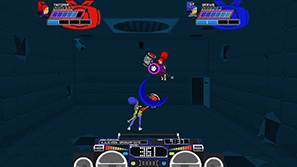 Lethal League is a fast paced, competitive sport game with a resemblance to squash. Your aim is to avoid being struck by the ball and be the last surviving individual. From what initially appears to be a calm game about outsmarting your opponent, it very quickly dissolves into chaos with online matches that have been the most tense I've experienced in a long time. Each match can hold two to four players. 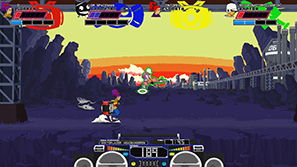 The ball appears in the centre of the play area and after a scramble for the first hit players can begin to be eliminated. There are two ways you can hit the ball; X is the standard hit and B is a bunt (you'll want to play with a controller if you can, it's much more comfortable). Bunting the ball slows it and launches it in a small vertical arc. Hitting it again with the standard hit will increase the speed a little more than it would have done otherwise. Each character is assigned a colour and the ball glows with it after you hit. This means that the ball can safely pass through you giving you a brief respite from fear of elimination. Each round lasts until one character remains. A match ends when only one character has any lives remaining. 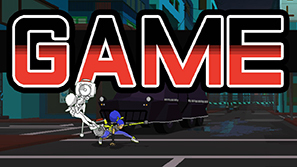 This all sounds pleasant enough, but there's a catch in Lethal League. The speed of the ball increases with every hit. The is a number at the bottom centre which denotes the current speed. 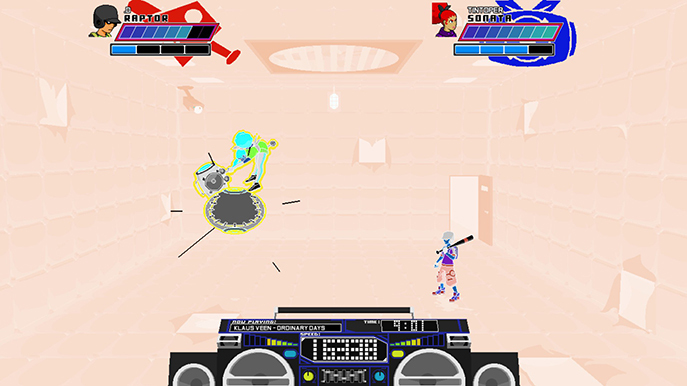 After several hits each character will have a build-up, holding onto the ball and boosting that number, before releasing the hit. The ball reaches terrifying and mind-boggling speeds. When you first start to play getting the speed over one hundred seems impressive and incredibly fast. The number will always increase. I've played in a game where the speed reached six-hundred thousand. To put things into perspective there is an achievement for surpassing one million. With the pace of the game moving at incredible speed there are ways to ensure that you can still keep up and avoid being hit. When a character is charging, a short meter in the bottom HUD begins to fill. If you strike the ball exactly when an opponent has the ball and that meter is complete you can steal the ball, charging it more, and take the shot. Of course, an opponent can then do the same to you. Another 'technique' is the less nuanced button mash; something I frequently resorted to. There is tremendous satisfaction in successfully returning a hit when the ball is zooming around at such speed you can barely see it. 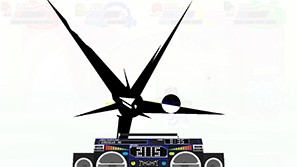 The visual and audio presentation in Lethal League is fantastic. There are a good number of varied environments to stage these matches and they all look great. Similarly, the characters animate well and all have character. There is a lot of colour throughout and the pixel art really stands out. The music suits the action well and includes some pieces that I'm going to locate for listening elsewhere. There are five characters and all are distinct and well designed. Each has their own characteristic and ability. For example, Sonata is the only character that can double jump, Latch can climb and cling on to the walls and Candyman can jump higher in a single jump than anyone else. Abilities can be performed every four hits and can give you an immediate advantage. They obscure the ball's movement briefly; making the ball pass through a wall and come back the other side or launching it without the usual build up. This doesn't sound like a huge difference but changing the flow of the ball can really upset concentration. 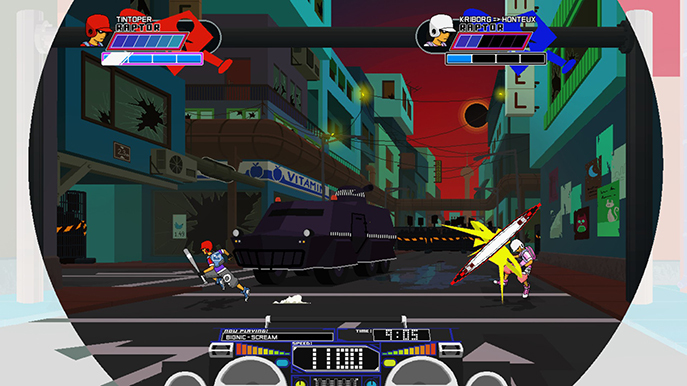 The main way to play Lethal League is online and thankfully the net-code is tremendous. Nearly all games I've played have had a input delay of zero (and I have terrible internet here), and gameplay is as smooth as it is offline. The only trouble is that it can take a while to find a game. I've always been able to find a game within five minutes but the wait is a little tedious. However, an easy way to rematch after you're in a game means you'll likely be able to play several rounds before people start leaving. The multiplayer is exhilarating. There are many players that are considerably better than I am and the speed of the ball is increased very quickly. The matches are fast and chaotic, especially when playing a four player free-for-all. I found myself holding my breath in anticipation as the counter for someone's charged hit nears its maximum and I concentrate on getting the strike at exactly the right time. The effects on screen mirror the events of the match. When the speed gets to ridiculous levels, the environment changes, swaps colours and becomes inverted. These effects are all timed with a characters hit and exaggerate the gameplay to great effect. Sadly, the single player and local content aren't as good as the online matches. There are a series of matches that can be played against the computer. It starts tediously easy and raises in difficulty with each stage. There are one versus one, two teams of two and free-for-all. It just isn't very exciting playing against a computer opponent. It, understandably, lacks the unpredictable nature of a human and I felt far less triumph in victory. Similarly, the local competitive matches felt underwhelming. The pace of the ball increases considerably slower than it does online and I had difficulty showing off the game to a friend. We ultimately took turns in online matches to experience the chaotic matches I knew of. With the stable online play these issues aren't bothering me too much. I will happily continue to play solely in the competitive online matches against other humans and will continue to have a great time with it. The speed at which the game accelerates to is both exhilarating and mind-boggling and it is a real joy to get that hit when the ball is moving so quickly you can barely see it. The rules and gameplay are simple, but it brings out my competitive streak. 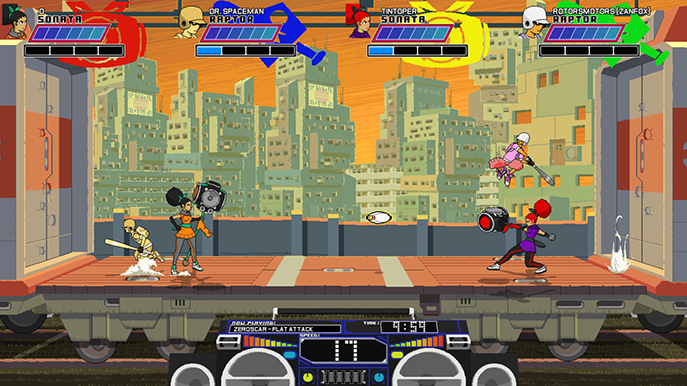 If you are looking for some great online multiplayer action you can't go wrong with Lethal League.